Graphics and large stylized text blocks constructed entirely out of the ASCII keyboard characters is called ASCII art. You may have seen it with the goofy ASCII Star Wars thing, but once upon a time it was very popular to stylize messages and images on BBS’s, IRC, MUDs, message boards, and across the early days of the internet in general, it has since largely fallen out of favor to, well, actual graphics and images. 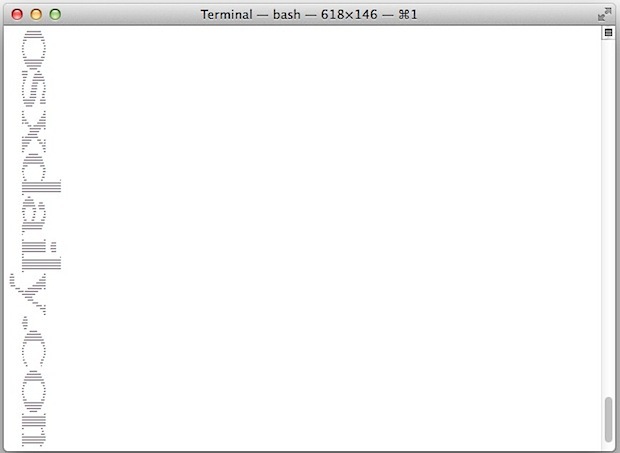 Nonetheless, the command line in Mac OS X provides a retro-throwback with it’s very own ASCII art banner creator, appropriately called ‘banner’. To try the ASCII art building banner command yourself, launch the Terminal app from the /Applications/Utilities folder and follow along. This will output the banner text at a much more reasonable 20 character width. But by reducing the overall width, you’ll also reduce the quality of the ASCII art, so if you want things to be sharp keep the larger size and then manually reduce the font size of the output yourself, either in Terminal or with an app like TextEdit. You can also choose to manually rotate the text yourself in third party applications, but the banner command in OS X doesn’t print horizontally. For those who aren’t comfortable digging around the command line, or who don’t want to have large vertical banners, you can always use a web-based ASCII art generator found here, there’s even a variety of font options if you feel like customizing things a bit further. Just copy and paste the output where you want it to appear, a perfect solution for those wanting to get their email signatures looking like they’re coming from 1994. Is this the most useful thing in the world? Well no, but it’s fun. If you’re now on an ASCII kick try busting out your favorite flick in the absolutely hilarious VLC video-to-ASCII player. Slow news day, eh? The banner command has been in in Unix-based operating systems for only about 30 years and you are now reporting on it? We can always aim to cover more Apple news type topics if their is heavy reader demand for them, just let us know! Well I’ve never heard of the banner command before, so it’s news to me. Maybe Rob can share some of his 30 years of Unix-based operating systems wisdom with the rest of us? I’m all ears, I love this stuff! Wow what a throwback! I never knew banner made it into osx, very old school and so awesome to have some ASCII fun. What’s next rogue/hack/moria!!? C’mon Apple. Where’s your sense of history. Back then you knew you were really in the R&S when you get a double-panic. That’s like a blue screen of death triggering another blue screen half way through – for you youngsters. figlet is also a fun one.